Take in the highlights of Alberta and British Columbia on this two-week road trip, with epic scenery, wildlife viewing and glistening cities along the way. From the glaciers and lakes of the Rocky Mountains to the rugged coastline and rainforest of Vancouver Island, the jaw-dropping scenery in this part of the world is hard to beat. All of our North American road trips can be tailored to meet your exact requirements. Do you have more or less than 15 days for your road trip? No problem, we can bolt on extra nights to allow more time to explore or shorten the number of destinations as required. Just let us know when requesting your quote. Two stunning Canadian Provinces, we loved Vancouver Island too. Welcome to Canada! Settle into the new time zone this evening and enjoy dinner at one of the great restaurants in the city. A day at leisure to relax after the flight and enjoy Calgary. Take a trip up the Calgary Tower to see the city from up high, visit the Calgary Olympic Village and spend some time relaxing at Prince's Island Park. The famous Calgary Stampede takes place during July and this is when the city comes alive with 'Stampede fever' and visitors and locals join in the western party atmosphere. If you are hoping to visit during this time, early booking is advised. This morning you will leave the city behind and make your way towards Banff National Park and your first glimpse of the famous Canadian Rockies. You might like to stop off for a coffee in Canmore and visit the nearby Grassi Lakes. Enjoy the afternoon in the town of Banff. You might like to visit the hot springs, take a gentle float down the Bow River or a cruise on Lake Minnewanka. We also highly recommend taking the gondola to the summit of Sulphur Mountain to take in one of the best views in the Rockies! A day at leisure around Banff. Perhaps spend the day exploring nearby Lake Louise and Moraine Lake, and taking in the jaw-dropping scenery of this area. There are lots of walking tracks to enjoy, or you might like to rent kayaks and take in the views from the water. You will also find Johnston Canyon nearby which makes for a great short hike and be sure to keep your eyes peeled for the local wildlife! We recommend an early start today to make the most of the incredible drive ahead - the Icefields Parkway! There are so many scenic viewpoints and short walks to enjoy along the way, as well as the opportunity to see wildlife. Some of the highlights not to miss include Peyto Lake, the Columbia Icefield, Sunwapta Falls and Athabasca Falls. You might also like to take a trip on the Ice Explorer tundra buggy at the Athabasca Glacier and Columbia Icefield. Enjoy today at leisure in the Jasper area. 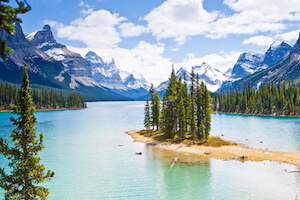 We highly recommend visiting nearby Maligne Lake where you can take a cruise out to Spirit Island, and Maligne Canyon is also well worth a visit. There are many activities on offer in the area including white-water rafting and horse riding, or perhaps just take the scenic SkyTram ride for incredible mountain views. Today offers another opportunity to explore the Icefields Parkway, taking in any of the sights and viewpoints that you might have missed on the way up. Your journey will continue on to Yoho National Park, where you can enjoy the picturesque Emerald Lake. There are lots of walking opportunities in the area, or you might like to get out on the water in canoes. Nearby Natural Bridge and Takakkaw Falls are worth visiting too. Enjoy the day driving over to Kamloops, admiring the scenery along the way. The drive will take you through Glacier National Park where you take in the views from Rogers Pass, the highest point on the Trans Canada Highway. Continuing on, you will pass through Revelstoke and Shuswap Lake and be sure to stop off at D Dutchman Dairy for an ice cream and to see the animals. 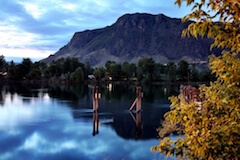 On arrival in Kamloops, you will have the evening at leisure. Today you will continue your drive west to Whistler. 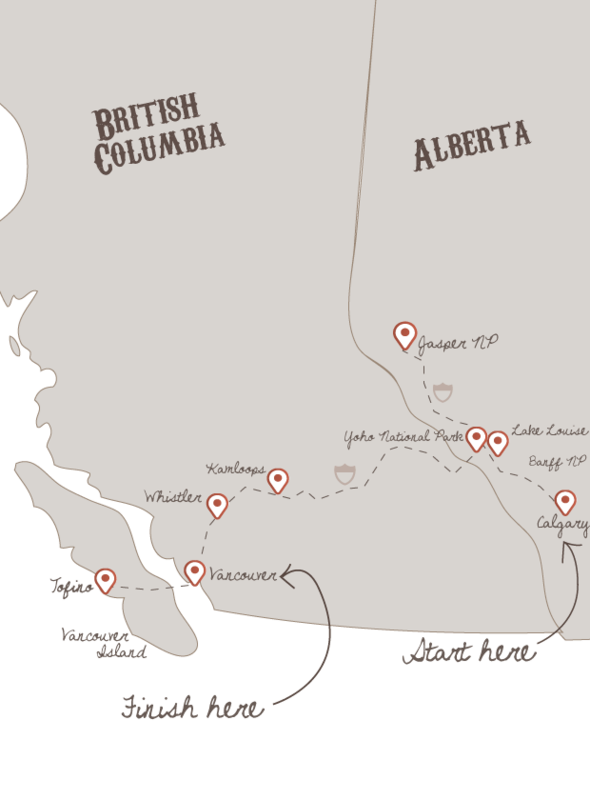 The drive will take you through more beautiful mountain scenery and it is worth breaking the journey at Marble Canyon Provincial Park, Joffre Lakes and Nairn Falls. Remember to keep an eye out for the local wildlife and fingers crossed you might spot a bear or moose along the way. Whistler is famous for being one of the best winter resorts in the world, but it is also well known as a summer outdoor playground too. The slopes of both Whistler and Blackcomb mountains provide a great base for hiking, mountain biking, zip lining, 4WD expeditions and white-water rafting. The Peak-2-Peak gondola experience is a must for any visitor and the alpine village provides great dining and shopping opportunities. Nearby Lost Lakes provides a lovely setting for a relaxing walk too. Today you have a full day's journey ahead of you to get to Tofino, including the scenic ferry ride over to Vancouver Island. We recommend an early start to get the most out of it; starting the day by driving down the Sea-to-Sky highway. Stop off at Brandywine Falls and Shannon Falls along the way and the enjoy the magical views of the Howe Sound as you travel down the coast. You will then board the ferry over to Vancouver Island and after disembarking, perhaps stop off at The Old Country Market in Coombs for a late lunch and to see the 'goats on the roof'. There are plenty of beautiful views to take in as you drive across the island to Tofino, and be sure to stop off at Cathedral Grove to see the giant Douglas Fir trees. A full day at leisure to enjoy Tofino. Sitting at the centre of Clayoquot Sound, Tofino enjoys a perfect position between the crashing waves of the Pacific and the mountains and rainforests inland. The stunning beauty and ecological diversity of the Clayoquot Sound UNESCO Biosphere Reserve is the source of most Tofino activities and it is the perfect place to arrange a whale watching or bear watching trip. Should you like to bolt on a couple more days then we suggest Victoria, on Vancouver Island. This is the capital of British Columbia and a great place for whale watching. Make your way back to Nanaimo today for your ferry crossing back to the mainland. Before heading to downtown Vancouver, we recommend spending the afternoon around North Vancouver, taking in the sights of Capilano Suspension Bridge and Grouse Mountain. To get up Grouse Mountain, you can take the Skyride gondola and at the top, you will not only find amazing views but also sights such as a wildlife refuge, the Lumberjack show, the Peak Chalet and lots of walking tracks. A full day at leisure to enjoy one of North America's favourite cities. Discover the historic Gastown district with its famous Steam Clock and old-world charm, perhaps take a water taxi across False Creek over to Granville Island, home to the Public Market and some great boutique shops, galleries and cafes. Stanley Park is another part of the city to make time for and walking or cycling around the seawall makes for a great excursion. You can also find the aquarium, totem poles and several restaurants within the park. We usually try to book a late flight back tomorrow to give you more time for everything Vancouver has to offer. Don't forget to check out this road trip's Itinerary tab to see more amazing pictures from our 'Discover Alberta & British Columbia' tour. You'll also be able to read a little bit about what you'll be getting up to on each day of this incredible road trip adventure.